The first major difference between SLRs and digital compact cameras is what prevents most people from buying an SLR: price. Even though digital SLR prices have come down each and every year, they are still significantly more expensive than their compact cousins. Let me put it this way: an inexpensive digital SLR camera starts around $450 without a lens. Then you get to tack on an additional $100 for a kit lens or $500 for a high-quality zoom. If you can't fathom spending $500 to $1,000 on a digital camera, then an SLR is definitely not right for you. However, if you've been saving you pennies for months and are perfectly aware of how much these cameras cost, then let's take a closer look at some of the other differences between SLRs and digital compacts. Anyone who wants a camera that fits in their pocket can forget all about digital SLRs. Size and weight is the second most obvious difference between SLR and compact digital cameras after price. Even a small-sized digital SLR camera is twice the size and bulk of a compact camera. While there are many new digital SLR models that are more portable (and are easier to travel with) the addition of a lens to your camera ensures that you'll never be able to stow it away in your shirt pocket or purse. If you'd like the higher image quality of a digital SLR but don't want a huge heavy camera, then consider a mirrorless DSLR - they're more the size of compacts but capture DSLR-like photos (and you can change lenses). Prior to 2008, digital SLRs with video did not exist. Digital SLR cameras could only take stills, and many people were suprised that these big expensive cameras could not capture video clips like their tiny compact cousins. All that is now in the past: virtually all DSLRs released since 2008 include a High Definition (HD) video capture mode. But the one thing that really sets DSLR video apart from compact video is the ability to change lenses. Since you can change lenses on your DSLR, you can capture videos that look more like movies: extreme wide-angle shots, close-ups and backgrounds thrown nicely out of focus can all be achieved with a digital SLR. This explains why many small independent film companies now use DSLRs as their camera of choice. Compared to the price of a high-end digital video camera, a DSLR is pretty cheap. Compact digital cameras have electronic zooms: push a button (or lever) and the camera's lens zooms in and out. Since all digital SLR lenses can be removed from the camera body, the zoom mechanisms are entirely manual: to change the view you have to twist a ring on the lens. This manual zoom actually results in a faster zoom: you don't have to wait for the motors to move the lens in and out, you can twist the zoom ring as fast or slow as you like. Since we're on the topic of lenses, let's talk about another difference between SLR and compact digital cameras: zoom range. There are many compact cameras on the market today with "mega-zooms". These cameras have 10x or 12x zooms and are capable of taking both wide angle and telephoto shots. If tons of zoom range is important to you, the compact is clearly the more economical solution. Even though I've talked about the difference between SLR and digital compact cameras you still might be on the fence. Do you want to take more professional-looking photos? Do you want to create high-definition home movies? Do you want to be able to change the lens attached to your camera? Do you want more control over the photos that you take? Are you sick and tired of the slow speed of your compact camera? Do you want to take lots of photos in dim light? 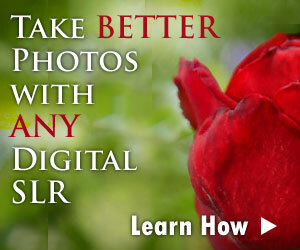 If you answered YES to every question, get a digital SLR. You'll be happier in the long run. If you answered NO or MAYBE to one or more, then consider a digital compact or mirrorless DSLR instead. Step 2 (Part I) - What is a Digital SLR?